Is your Violin Chin Rest a Good Fit? 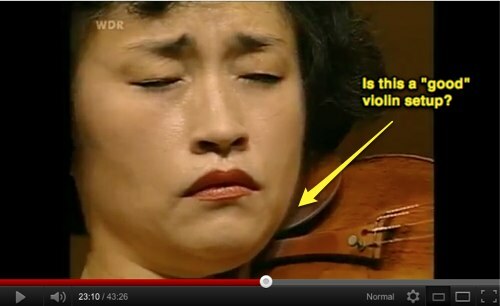 First of all, enjoy this video of Kyung-Wha-Chung, one of the great violin artists of our time. It’s a fabulous, world class and heartfelt performance by any standard. Viewed from the perspective of a violin teacher, I feel obligated to point out that from a setup standpoint, the violin and the violinist may not be set up to best advantage, though I would be the last to suggest that Ms. Chung change anything about her playing. On the other hand, when I see a fit or setup problem in a young student, I would always try to make things more comfortable and practical. In this case notice that the player’s jaw bone isn’t aligned in the “groove” of the chin rest. Often in a case such as this, a chin rest that floats over the tailpiece of the violin might be more comfortable for the player. It won’t work for everyone as factors such as length of neck and arms also come into play. All of this can (and should) be analyzed by someone experienced in optimizing the violin/chin rest/shoulder rest combination. So why does this work so well for Ms. Chung? Simply because her approach to the violin is dynamic, not rigid. The instrument isn’t locked into place. Rather, it floats, moves and adjusts along with the needs of the musical passage. The weight of the violin is balanced between multiple points, keeping the head and neck free of excess tension. It’s a great lesson for every player. Why make things difficult when they can be simple? For our younger Invincible Violinists and their families, know this: Never accept your instrument setup at face value. The size, lift and type of chin rest, the presence (or absence of) a shoulder rest, the way your instrument relates to your body and its movements, all of this, shouldn’t be left to chance. Violin String Broke! Now What? No need to panic. We can fix this! Click here to replace your snapped violin string. 1. As a violin parent, learn to tune the violin properly. The easiest way to break a string, especially an E string, is to tune it too high. Don’t ask your 5 year old student to perform this operation! 2. Before installing new strings, lubricate the 2 contact points at the bridge and nut of the violin with a small amount of pencil lead. 3. Be sure that your instrument has quality tuning pegs that operate smoothly. Pegs that slip make you tune the strings more frequently, adding stress and reducing their life. 4. When tuning, gradually raise the pitch of the string to the required note, but not more than a small amount above. On student violins, use the fine tuners to make small adjustments, in lieu of the tuning pegs, which can be more difficult to operate. 5. Use an electronic tuner when learning how to tune. Tuning by ear is risky, if you’re not trained in that approach. 6. Practice often, and tune at least once at the beginning of every practice session. 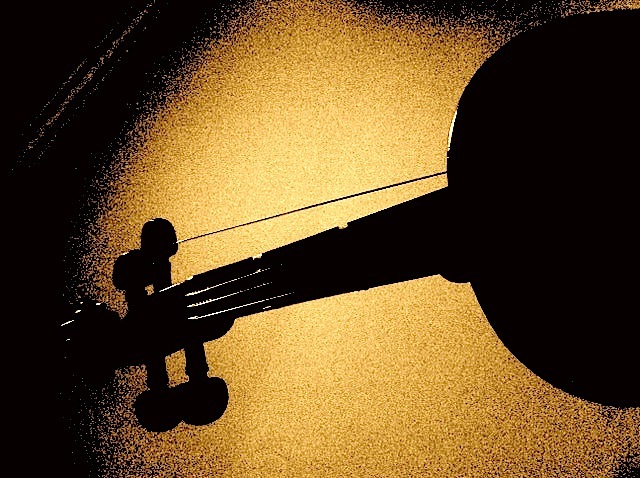 A neglected violin is more likely to lose its tuning by a large amount. 7. Purchase quality strings that are correctly sized for your instrument. Keep a spare set in your case, and perhaps more than one spare on the E string. Click here to visit my violin string website for complete instructions on how to replace your snapped violin strings. Except from: Master Sequence for young beginner students. 1. Violin “setup” correctly and comfortable on the collar bone. This will be more fully described in the InvicibleViolinist.com Master Sequence. 2. Learn to properly position the left “violin” hand around the neck and fingerboard. This is probably the source of more “screw ups” than any other element of early violin technique. If you focus on mastering the left hand early in the game, everything that follows is relatively simple. I created this exercise because this hand-violin relationship is much easier to learn when broken down in steps. When (and only when) your student can perform this simple movement in good form, do you move to the next step. This “umbrella” of fingers over the fingerboard and hand astride the neck is simple to perform with the violin in a guitar like position. Note the elevated angle of the scroll. 3. Finally, move the violin with (hand and arm already in perfect position) into playing position. Once in position, our Master Sequence Practice Angel will test for correct posture and freedom of movement. If you enjoyed this, please share or tweet this page or post, using the buttons below. Thanks! When I was a young student, I wasted my share of family funds in the violin studio. I was unprepared. I didn’t fully understand what the teacher was saying. The subject matter was over my head. The teacher couldn’t explain it in a way I could understand. It could be 1000 things. And over the years, it probably *was* 1000 things..
And it’s not all on the student side; teachers are human… they make mistakes too. They miss things that should be fixed. Or they don’t know how to correct problems that the students brings into the studio. Enter the real world; distracted parent, exhausted student and frustrated teacher. This is not a recipe for making progress on the violin. It gets me when people worry about the high cost of private lessons, then turn around and barely put any effort into making good use of the invested time and money. It just doesn’t make any kind of sense. That’s why Invincible Violinists are always fully prepared. They value their time and money. They want to use their teacher’s expertise in the best possible way. Whether in the studio or at home, they’re embracing the best practices. The most expensive violin lessons you can ever take, are the ones you have to take over. And over, and over.